April 2019 and another of Leafy Lane's mature trees is laid low ... but perhaps not. Pollarding is one of the techniques for ensuring longevity (the other is coppicing). According to Oliver Rackham, 'An ash tree usually falls to pieces and disappears at about 200 years. If periodically cut down (coppiced or pollarded) it regrows indefinitely and will often live to 400 or more' (The Ash Tree, 2014, p24). Locally, we see pollarded willow, hazel, lime, even horse chestnut but I cannot recall any pollarded ash - this one, if it does pollard (see below), will be a local first. This is the ash at the southern end of Leafy Lane, shown below last summer (at left) and now at right and below. The ash, according to the tree fellers (but there were only two of them? ), was/is suffering from ash dieback with twigs showing, apparent, distinctive yellowing. The remaining trunk has a number of new(ish) shoots emanating from the severed branches. Daniel (of Tree Parts, Ashley) predicted that these shoots will wither because of the dieback. But nil desperandum, if they don't and the tree continues to sprout, it will outlive us all. In Rudloe (or Radlow as it is known locally), at this time of year, one will orfen see locals retiring to the terrace for a Pimms (there used to be a selection of seven but now just one) before sapper. In keeping with such castom, each day Daniel and Sam brought a lanch hamper; on the day of the picture the sandwiches were of the rather prosaic pastrami but last week they partook of gravadlax (salmon to you) and dill. With regard to ash and pollarding, there is a photo of a 'copse' of pollarded ashes on page 100 of The Ash Tree (Rackham). Another interesting book on ash is The Ash and The Beech by Richard Mabey (2013 in Vintage paperback). May 2017 and another miracle unfolds at Rudloe Fiveways. The images below are of the tree at the top of Westwells Road, inside the ex-RAF Rudloe Manor No. 2 site (not exactly Leafy Lane I admit but close enough). The tree is unusual and remains to be identified but initial research suggests that it is a 'single-leaved ash' (however, the winged seeds of this tree don't quite fit with illustrations of the single-leaved ash's seeds). 29th October 2016 - The Miracle of Leafy Lane. For unfathomable reasons, I have walked past the tree opposite the entrance to Springfield Close (in the Wessex Water compound) hundreds of times without taking too much notice of it. However, I do believe it is an elm and as only a few elms survive around the country, this could be the Miracle of Leafy Lane (if I am right). Familiarity breeds contempt maybe. 'Population numbers: occurring widely across Europe, in particular throughout the Mediterranean. In the UK the greatest numbers are found in the Bath area, this being close to the centre of its UK distribution with the concentration of colonies spreading into Wiltshire where four Protected Road Verges in Wiltshire have been designated due to their population of Bath asparagus. This very restricted distribution, exacerbated by its large seeds which make dispersal difficult, has led to Bath asparagus being recognised as a nationally scarce species in the UK and also protected under the Wildlife and Countryside Act (1981)'. February 2015. A rudloescene reader has asked for the Tree Preservation Order information for Leafy Lane Playing Fields to be published as most local people are unaware of it. 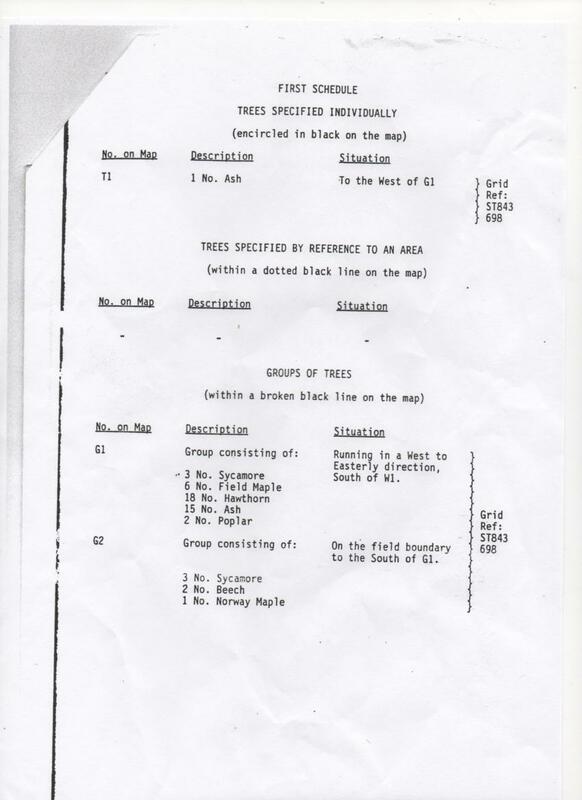 The files below show the order itself dated 1995 (also shown in the title picture above) and the two schedules, one for the woodland and the other for individual trees (note that 2 No. poplars in line G1 are misidentified - they are whitebeams).. 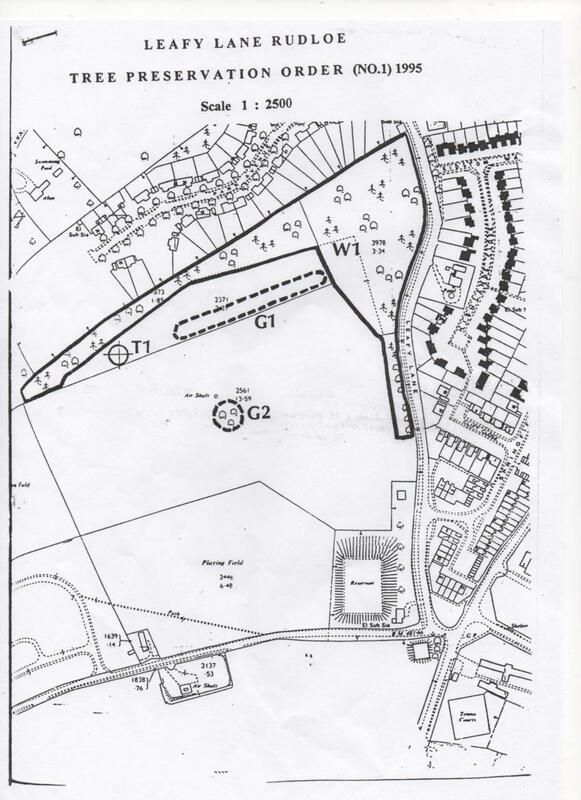 The requirement to publish has come about as Leafy Lane Playing Fields Ltd in early February 2015, has been removing scrub in the line of trees labelled G1 on the TPO. Unfortunately, during this removal work six of the hawthorns in the 'individual tree' schedule have, effectively, also been removed. Locals who were involved in the setting up of the TPO through the Rudloe Action Group (RAG) in 1995 were now (in 2015) bound to involve Wilts County Council (the enforcement organisation) in order to try to put a halt to the removals. Mrs Wooster, who lived at Rudloe House in Leafy Lane, was very interested in wildlife. 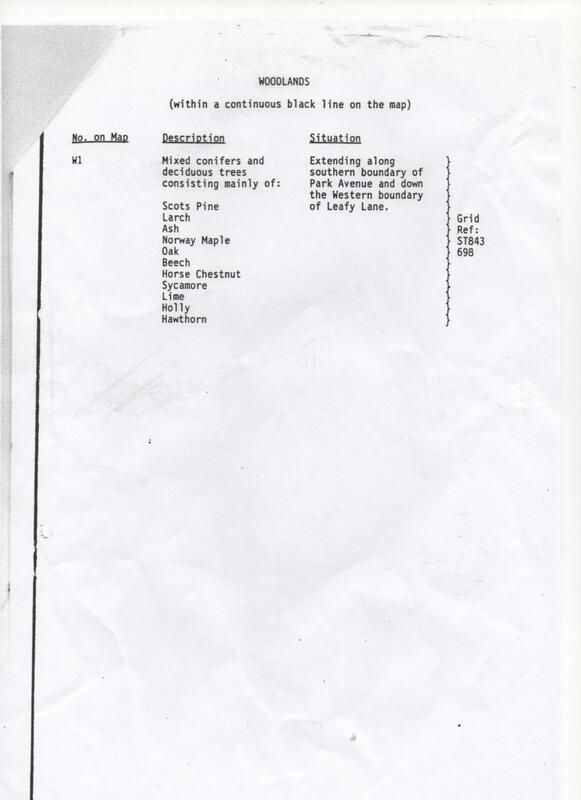 She produced lists between 1982 and 1994 of the flora and fauna seen in Leafy Lane Wood and elsewhere; the lists are shown below. I have been presumptious enough to produce a 2010 update of her lists, shown at the end. Mrs Wooster would be distraught at the carnage of Leafy Lane flora. The beeches, shown below, were the subject of tree preservation orders (TPOs); there were many trees on the east side of Leafy Lane with TPOs, now there are just a handful. The limes, I believe, were considered a litigation risk by shedding leaves into the road! Leaves! Off with their heads! The most criminal act though was the felling of a magnificent ash (also with TPO) at the entrance to Kidston Way. As usual, if asked to investigate the health of a tree, a tree surgeon will find problems. Find me a tree without problems! Nice work if you can get it.